Around this time last year I did a post that looked at Leinster's chances for the upcoming season...given how things turned out I guess I'd better keep this new annual tradition going, hadn't I? First I must ask the question that needs to be asked before any other by Leinster fans...just how on earth can we possibly top that 2017/18 campaign????? "By doing it all again!!!! Duh!!!!" Yeah, yeah I know. The double has always been the dream since we put that first star on our jersey, and now we have actually done it, it's hard not to make it the standard for us. But let's be honest...are we really going to say that all we'll accept in the upcoming campaign is a repeat??? Personally I don't think it's unreasonable to take those demands down a notch, though only the one. Yes, I want us to keep to the same standards. And yes, I want the younger players filtering into the squad to improve. And yes, I want the gaping holes left by great players retiring or leaving to be adequately filled. But I've been doing this 'sport-following' lark for long enough to know that the biggest downside of a virtually perfect season is that the target on your back becomes that much bigger when you try to do it all again, not to mention the fact that there's every possibility that more than one team around both league and continent will significantly improve their own performance levels. So to summarise, while of course another double would be marvellous, to make it an expectation would be as unrealistic as it would be arrogant. That said, should we get to next May without adding to the trophy cabinet I would probably feel like we fell short so that only leaves one option...just the one piece of silverware will do me, lads, for what it's worth. No pressure then!!! Right, so now to get on with the actual task at hand, namely looking at our squad and come up with an ideal starting XV before a ball is kicked. The format for this post is exactly like last year's in that the squad info is taken from the unofficial Leinster fan message board Babbling Brook, courtesy of a poster with the ironic handle 'mildlyinterested'. Any team in Europe would love to see the kind of competition Leinster have for pretty much every position, and it starts literally at the number one jersey. This time last year, Jack McGrath was deservedly in possession of pole position, but Church didn't take that lying down and a string of fine displays put him back on top. Would it be unfair to say that Jack's form dipped a bit as well? Perhaps, though putting it as a question rather than a statement definitely gives me some wiggle room! When it comes to further down the pecking order, while both Byrne brothers had some fine displays in the Pro14 last season, I have always been impressed by Peter Dooley and Lansdowne FC were extremely fortunate to have him available for the Ulster Bank League final...I'd have him next in line behind our test pairing. Again the top two is easy to choose though there can be no disputing the order...when you're a tight head who had a great Lions tour in New Zealand followed by a season when you get man of the match in a Grand Slam decider at Twickenham, you'll be the first name on pretty much anyone's team sheet. Still though, Andrew Porter has done remarkably well to prove himself at the highest level, fully justifying the faith his coaches all the way up to the top have shown in him when swapping sides in the front row. Next in line should be Michael Bent, yet while he has certainly been a reliable performer for Leinster in recent times to say the least, I'm wondering if we should be considering giving more game time to the likes of Vakh Abdeladze coming up behind him. This is a straightfoward pecking order, 1,2,3,4 as you see them above. Remember this time last year we were all moaning about wayward lineout darts? If only we knew what was to come. That's not to say the setpiece stumbles are acceptable and hopefully the lads will have worked on them. I have a feeling this could be something of a breakthrough season for Bryan Byrne if he gets half a chance. Now we're getting into the tough choices. Devin Toner, James Ryan, Scott Fardy. Only two of them can start in my ideal XV's second row. That doesn't make any sense!!!! Unless we get creative? Unfortunately, I'm going to have to. Toner and Ryan should be left together, yet you'd have to be insane not to waste Fardy's immense skillset around lineout and breakdown so...even though we're still well stocked in the back row department, and even though there were specific reasons why he came to us as a lock, I'm putting him in my lineup at 6. Sue me. Next down the pecking order I think it's time for Ross Molony to step up and catch Joe Schmidt's eye; hopefully he'll be able to take the opportunities when they come for him. First, there has been a lot of talk around t'internet about Sean O'Brien's future. Of course the hip and shoulder problems seriously limiting his game time don't look good for any player but Seanie in particular is at the point of his career, particularly in his position, when there is bound to be doubt. But until there is any official announcement, he's definitely up for selection and he not only walks into my ideal XV, he does so as captain. 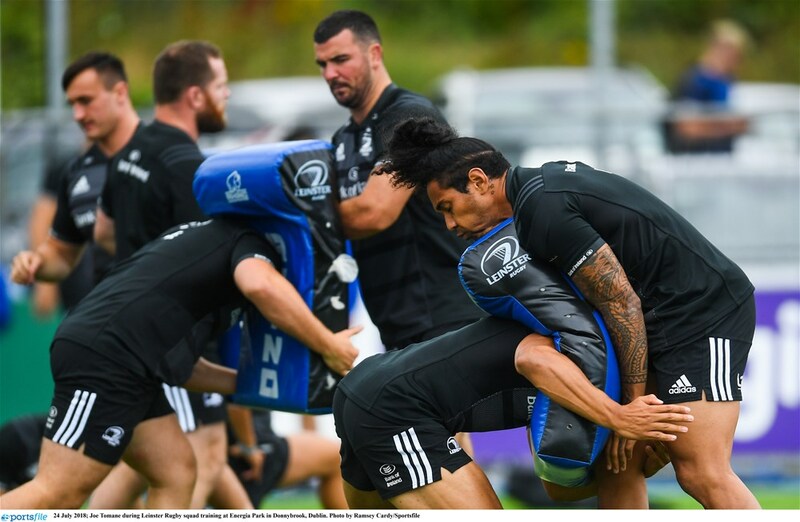 I have a feeling Johnny Sexton may want that role for himself and if he does, far be it from me to object, but it has always been my view that 10s shouldn't also be captains and if Seanie thinks he has a full season in him, then I'd want him leading the side and I reckon he could do that from the number 8 position. With Fardy at 6 that leaves just the openside up for grabs and last year I got some stick when I opted for Dan Leavy and I reckon I was vindicated so he stays. When it comes to back up, since Fardy can also cover lock I'd put two back rowers on the bench and Josh van der Flier only misses out to Messrs Ruddock and Conan because of the cruel timing of his season-ending injury, and despite the fact that he's not in my 23 I'm sure we'll be hearing much from him over the season to come, as we will the likes of Max Deegan, Josh Murphy, and Caelan Doris, who impressed in the Under 20s World Cup despite Ireland's disappointing results. Naturally Luke is easily our first choice. Next down the line, the blasted 'ANZAC rule' (as I call it) is going to rear it's ugly head again for Leinster unfortunately, and while Jamison Gibson Park went way up in my estimation last season, when forced to pick two out of three for my ideal 23 between himself, Fardy and Lowe, let's just say it's good news for Nick McCarthy. Although we didn't see a whole lot of Charlie Rock I thought he was well poised to get more game time this season but it seems he hasn't been kept on so for that fourth option we'll have to rely on Hugh O'Sullivan out of the academy. I wasn't exactly dancing in the streets when I heard Joey Carbery was off to Munster, but there was a very big positive for Leinster in that it finally made our outhalf pecking order abundantly clear. Ciaran Frawley got a bit of game time at ten and should get more opportunities this season and no doubt the media will be chomping at the bit to report on young Harry Byrne coming on to replace his brother Ross at some stage. But on a serious note, if Leinster are to get anywhere close to matching last season's success, we will need Ross Byrne to up his profile. That might sound harsh as he has done very well up to this point, but without the Carbery factor, if Ross remains fit he's going to be leading Leinster's backline quite a bit throughout the campaign and any dip in form would be costly. I reckon he's up to the challenge though. When picking my ideal XV last year I had a rule of thumb that new players automatically got into the starting lineup, as that would serve to refresh the look from the previous season. Unfortunately in Joe Tomane's case I can't do that, even though he is a most welcome addition to the squad. The "Henrose" centre pairing is the bedrock of both Leinster and Ireland's future as far as I'm concerned, so if both are fit for big European matches I'm not entirely sure if Joe would feature for us despite his experience (though he could of course be an option on the wing). Further down the line I wonder how much we'll see of Noel Reid, not so much because of his own abilities, rather the need to bring others on like Tom Daly and Conor O'Brien. As for the 13 channel, I reckon we could see much of Rory O'Loughlin, also Jordan Larmour can play there, and from the 'next generation' Tommy O'Brien has shown at Under 20 level he has a future in the blue jersey and maybe higher. Rob Kearney (32) - Signed central contract until 2019 WC. Once again I must apologise to Rob Kearney for leaving him out of my ideal lineup last season. I just hope I'm not jinxing him by naming him this time around!!! As for the wings, I'm going for two fellow JLs. Lowe gets in because of his x-factor. Both Leinster and Ireland have built their immense success over the years based on very structured rugby yet I have always felt that team sports, especially this one that has as many as fifteen on the park at a time, you always need at least one who is willing to 'have a cut' based on what he sees before him and Lowe fits that bill perfectly. As for Larmour, although his future may well be at 13 or 15, I think a full season on the wing would be good for his game. He has shown he can be a game breaker and nobody is disputing that, but I reckon a spell out wide, particularly under the current crop of Irish coaches, should improve his decision making. Ferg's experience earns a spot on my bench though Barry Daly's ability to find the try line made him tough to leave out, and I'm assuming Adam Byrne will be keen to put his name back up in contention as well.